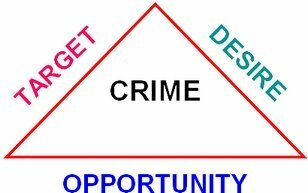 When hearing the words, Crime Triangle, what comes to your mind? Yakuza? Russian Mafia? Italian Mafia? Chicago Mafia? LA Street Gangs? Bermuda Triangle? Cape Fear? All of these groups and areas tend to conjure up images of violent criminals and sustainable crime. However, the crime triangle is something much more benign. It is an understanding and awareness of how crime happens. By understanding the process, you, as an individual, can significantly decrease your chances of becoming a potential victim. Contrary to popular belief, the boogeyman doesn't just jump out of the bushes to attack you. Crime is a process and often follows a pattern. Let's take a journey back to middle school and fire awareness training. We were all trained that fire cannot happen unless three things are present: an ignition source, fuel and oxygen. If you remove any one of these components, you remove the threat of fire. This was known as the Fire Triangle. The same thing applies to crime. Three elements must be present in order for crime to be successful: desire, target and opportunity. These comprise the Crime Triangle. Fortunately, you have control of two out of the three elements. Let's take a look at each of the individual elements. The first element is desire. That is the criminal's drive, intent and motivation. There is nothing you can realistically do to curtail or eliminate that desire. Once he has the desire, he is looking for a target and an opportunity. This is where you come in. Can you guess who the potential target may be? A target is anyone who appears to be an easy victim. A target appears not to be aware of their surroundings and appears easy to overtake or overpower. An easy target, by definition, will not put up any resistance. So what can you do? You can "harden" the target by becoming more aware of your surroundings. By being aware of your body language: eyes up, shoulders back, arms swinging, walking confidently and scanning the area; you send a signal to any would be predator that you are not easy prey. By taking a self defense course, you further harden the target by gaining the skill set to fight back if you are confronted. The next element is opportunity. You control this by paying attention to your environment. Are you in a bad area of town? Are you walking in an unlit area? Are you in a secluded area? Are you letting strangers in too close to ask questions - not defining personal boundaries? Limiting opportunities is about being aware of your environment and your intuition to remove yourself from a questionable environment once you sense danger. We can take control of our own personal safety by understanding how crime happens and by educating ourselves to become tougher targets. In doing so, we begin breaking the Crime Triangle.